Shop our large collection of elegant leatherette ring displays and freshen up your store's look! 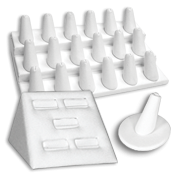 Find the best leatherette pieces, from ring trays, stands, boards & pillows to pads & inserts. Items for every budget: you'll find both faux & premium leatherette products, on black, white & other colors. Get the best deals thanks to our discount wholesale deals.